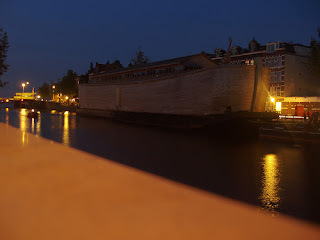 Noah's Ark sailed through Amsterdam last night, and I went out to practice my photo-taking chops. You never know when it's going to come in handy. Let me tell you, taking night photos is not easy: if you use the flash, it looks like day, and if you use a slow shutter speed, the image blurs. But I guess the photographers out there already know this. Oh yeah, I didn't misspeak. 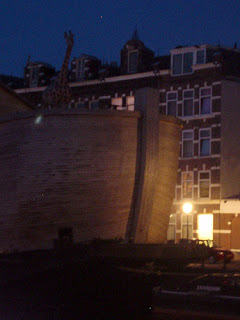 Noah's Ark: an earlier story. (note plastic giraffe sticking up from prow).